The Hawker Hurricane was the first monoplane fighter to see service in the Royal Air Force and the first aircraft to be equipped with eight guns. Designed in 1933-34 it was eventually contracted for by the Air Ministry of England in 1935. The Hawker Hurricane was the most numerous of the RAF's aircraft in the 1938-1940 period. The Hurricane continued in front-line service until the Japanese surrender. 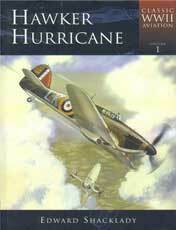 Hawker Hurricane is published as part of the "Classic WWII Aviation" series. Hawker Hurricane book: 165 pgs, hardbound w/dust jacket, 7 x 10, over 150 b & w and color photos and illustrations.